Pam Holland Designs and Productions: Portrait No 7. I've added a few tricks to this part of the portrait. The mouth was made separately and I didn't add it to the portrait until I was satisfied with it. I auditioned two fabrics for the background. One was heavy floral and looked lovely but it wasn't really what I was trying to portray. 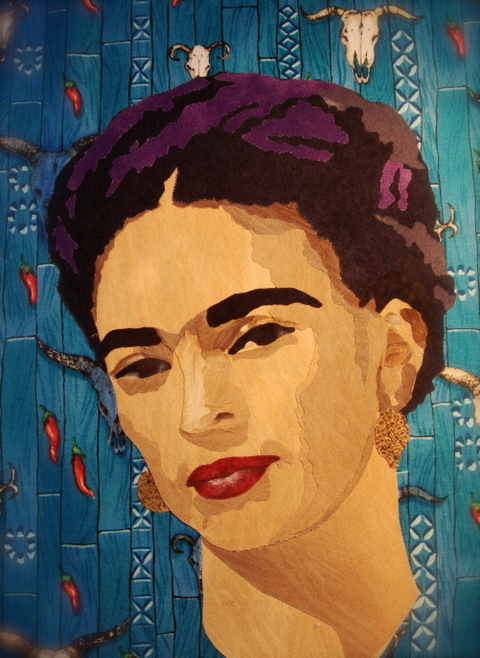 You can tell that this portrait is of Frida Khalo. She represented freedom, a vivacious spirit and that to me adds up to bright colors. This piece of fabric is a Kaufman fabric. I purchased it for another project... but if fits this one perfectly. It was difficult to place the face on this fabric because no matter how hard I tried I ended up with a steer skull protruding from part of her face. So if you look carefully, you will see that 4 of the skulls in the background fabric have been colored blue to match the blue in the rest of the background. It gives a white edge and I usually try to avoid using fabric like this... I will be able to fix it by adding ink to the edge of the fabric... but you can see the other fabrics look a lot crisper... that's the look I prefer.